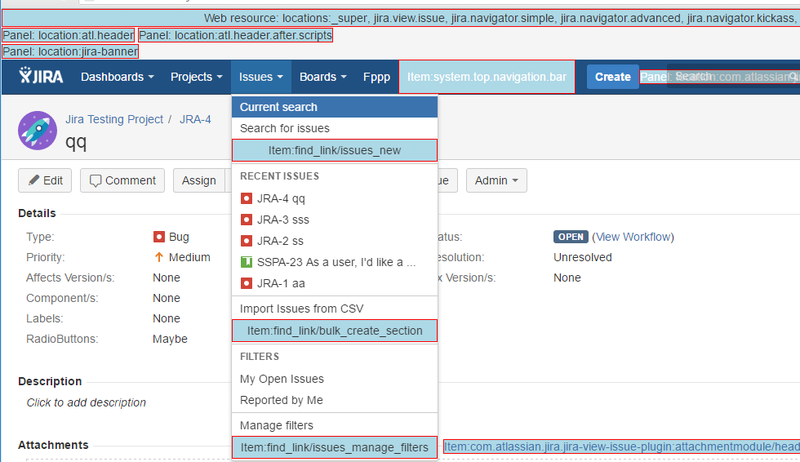 ScriptRunner is primarily concerned with the back-end, but also has the capabilibility to customise the web UI through dynamically adding web fragments - see the Atlassian documentation on web fragments for JIRA / Confluence. This is accomplised by adding a UI customisation at Admin → Script Fragments. As always, you should test in a development environment before deploying to your production environment. The general usage of these scripts is to go to Admin → Script Fragments, and execute one more of the built-in scripts. This will modify the UI in the chosen way. Following this, you can edit or delete the customisation. After restarting your instance the UI customisations will be in place. At the moment, some scripts will be reloaded automatically, but if not, you can edit the built-in script item, and click update. All of the built-in scripts produce XML that is similar, but not interchangeable with, the XML found in a plugin descriptor. You will notice that, for usability reasons, the forms do not provide all the possible configuration elements available in plugins. As an example, the web-item built-in script does not give you the option to provide a tooltip for the web-item link, or a velocity context provider, or an icon URL. You can work around this limitation using the raw xml module script. You may not know where the locations or sections for web items, web sections, or panels. The Fragment Locator tool is designed to show you the places where you can put these fragments. Enable it from Admin → Script Fragments. Enabling the fragment locator will change the appearance of every page for every single user, so should not be enabled in a production system. If this is not a production system then proceed to click the Enable button.